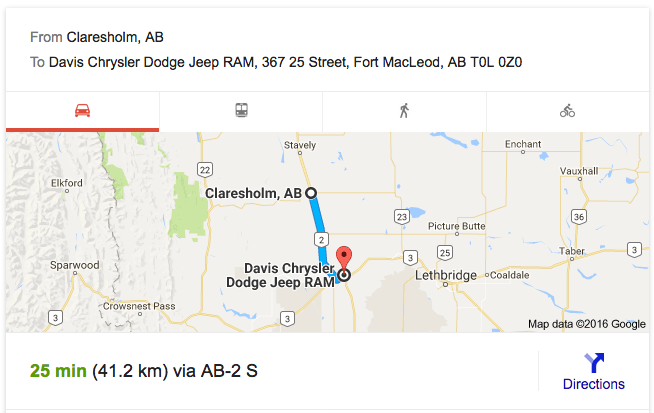 Davis Dodge RAM Chrysler Jeep in Fort Macleod, AB is always happy to serve our Claresholm Alberta customers. Davis Dodge RAM Chrysler Jeep is your best choice for everything Dodge, including new Dodge models and all-make Dodge Certified Pre-Owned vehicles, Dodge Service and repair, Dodge Parts, Dodge Accessories and more! TOP EMPLOYER IN CANADA: It’s not just our customers who are happy with our business, but also our employees! Our dealer group has been on Mclean’s Top 50 Employer’s In Canada list for 4 years in a row! CHAT LIVE ONLINE: You can chat live with a representative online. You’ll get a fast response and we’ll make sure to answer any of your questions. WE CAN ACCESS INVENTORY: What you see on our lot is only the beginning of what is available to you. Any of our stores within the Davis Auto Group can pull and share inventory with another store. On average we have around 400 Pre-Owned Vehicles and 700 New Vehicles in the province. View our Group-Wide Inventory.